So I recently saw something promoted on my Facebook that I NEEDED to check out. It's a new(ish?) 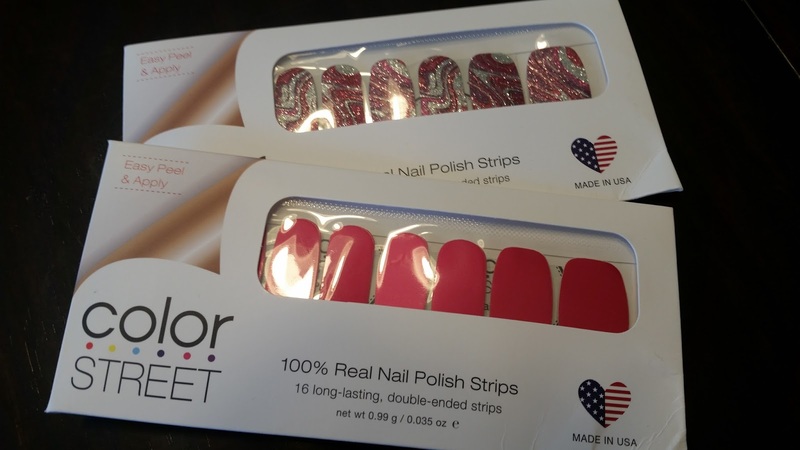 direct sales company called Color Street Nails. I love having my nails looking nice and done, but taking the time to let them dry, or the time and money to have them done just usually doesn't happen. Color Street has really made this so much easier for me. Check these things out! I used two separate designs and alternated, but it still seriously took me ten minutes - and I've now had them on for more than three weeks! There's way too much ugly growth showing, but the polish is not chipping or peeling. See, Color Street is real nail polish, in sheets. There are 16 to a package, of eight different sizes. You can even use both 'ends' of each nail tab, to essentially have 32 nails worth of polish! It also includes its own built-in top coat, so it really is one easy step. 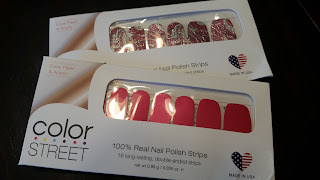 Each package includes alcohol wipes to dry your nails before application, and a tiny lil nail file to smooth the ends. These things are great! The few consultants I've run across only published their shopping address in an actual event, so I wasn't able to have one convenient to share here, but google that up, or ask on your own timeline if any of your friends are sharing Color Street nails yet. Overall, I'd highly recommend these polish sheets. My ten-year-old even did her own nails with Color Street, and they've even stood up to her level of kid play! 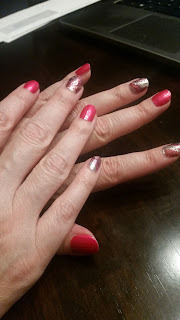 I am a huge fan of doing your nails (I think I may have been a southern belle in a past life, lol). The great thing is there are so many ways to do this now no matter your budget or time.